​It has always been interesting to me that when an angel appears in the Bible, , it is almost always accompanied by a message to “fear not”, oh what a sight these angels of God must be. Surely they don’t look like the cute little cherubs we portray them to be. But the angels main message was not about bravery, but rather a message of the “good tidings” which had come. In this situation, the word used for “good tidings” actually translates to “gospel”. 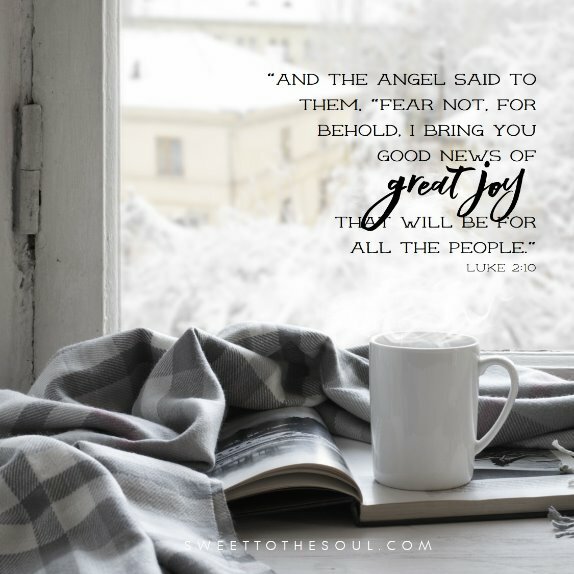 The angel is not only telling of the good news of Christ’s birth but also the good news, or gospel, of who Christ is and what he is here on Earth to do. But let's don't overlook those last 3 words... this amazing gift of Christ is "for all people". Initially intended for God’s chosen people, the people of Israel, but not actually for everyone. Let me explain. You see, the good news of Christ is available to everyone, but sadly this gift is not received by everyone. And in that day, not even all of God’s chosen people accepted Jesus for who he was. So while Jesus came for their salvation, it was a gift that many never received because they turned their back on Christ. We’ll talk more about receiving this gift on day 4. Another interesting point I read from a commentary talked about how the angels appeared to these humble, pious shepherds who were just doing their job. It’s a great reminder that we are not out of the way of receiving God’s messages when we are working in our calling and abiding with God. This too is good news for us! Lord, thank you for the gift of this good news. Thank you that you communicate with us to share your will and plans. Thank you for the gift of your communicators and may our hearts stay in tune with you so that we are ready to receive your messages of good news. In Jesus name, Amen. 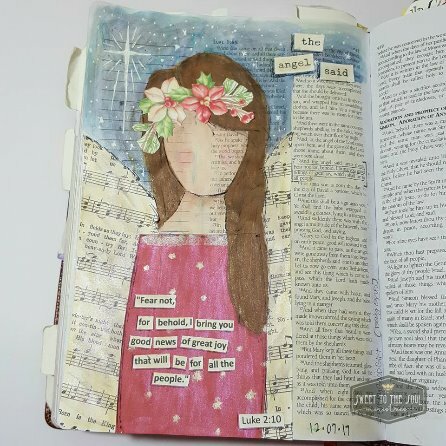 Then I cut her dress from some Christmas scrapbook paper and cut her wings from a hymn page. Next I used a glue stick to add both to my page. I also tested the placement first because I knew I would need to trim the right wing down to be able to read the scripture. ​I wanted her wings and dress to really sparkle so I painted over them both using my Gelatos and a waterbrush. ​Next came her hair. I penciled in her hair then painted it with acrylic paint. I used acrylic (craft paint) because her hair flowed over her wing and dress and I wanted good coverage. ​Before adding her flowers to her hair, I painted the night sky background, again using my gelatos, and 3 shades of blue. I added the stars with a white Uniball Signo pen (my fav!). ​Lastly for her came her halo of flowers. These are actually apart of this month's free Every Good Gift printable. So just print, fussy cut, and add with a bit of glue stick or double sided tape. 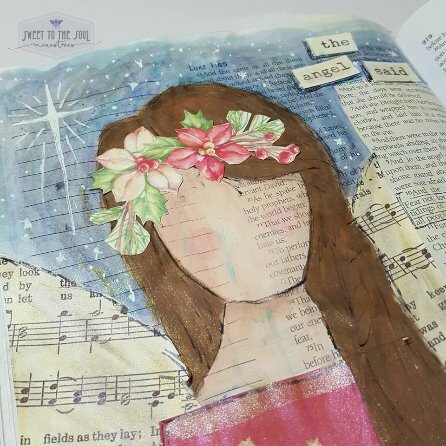 ​The word bits are also part of the printable, they are the Luke 2:10 scripture card, which I cut in bits then adhered with double stick tape. ​After she was all put together, I added a bit of beige to the rest of the page and the word bits to tone down the white abit. 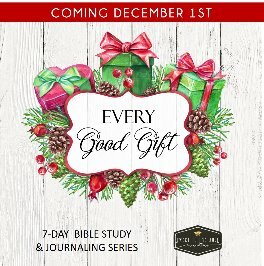 ​You can download the full 7-day devotional and journaling pieces for FREE through December 31, 2017 RIGHT HERE.